With travelling anywhere in Europe right now costing so much more than it used to, to here are some tips for saving money on every-day things so you can splurge on the things that really matter, such as where you stay, meals out and tickets for events. 1. Book train tickets as far in advance as possible. You can book Eurostar tickets up to six months in advance, and here’s a guide to other countries. If you can, book on the day the reservations open to get the best price. Often an upgrade to Premier Class at the very early stage is just a few Euros and well worth doing. 2. Check the hotel you want to stay at, if you’re staying at a hotel, that is, for any offers on their website. I’ve booked at places before and had to remind them that actually they’re offering 3 for 2, or another type of offer. It always pays to check – it may make that hotel you really like the look of affordable. And they may not give you an offer automatically. 2. Take your own hot drink mug with you – this may sound boring, but that Starbucks/Costa/Pret coffee every day can set you back a lot. I always take a Contigo Autoseal travel mug with me and fill it up with breakfast coffee the leave it in my room or carry it with me. Coffee addicts will tell me it’s not the same as ‘real coffee’ and no, it’s not, but it saves a lot of money particularly if you drink a lot of coffee or like to have a hot drink available at any time. If you're away for a long stay make your favourite coffee a treat, and the rest of the time drink your own. 3. If you’re visiting Paris, buy a Carnet of Metro tickets. The Paris Metro is excellent and far, far cheaper than taxis and, unfortunately, Uber particularly in the evening. 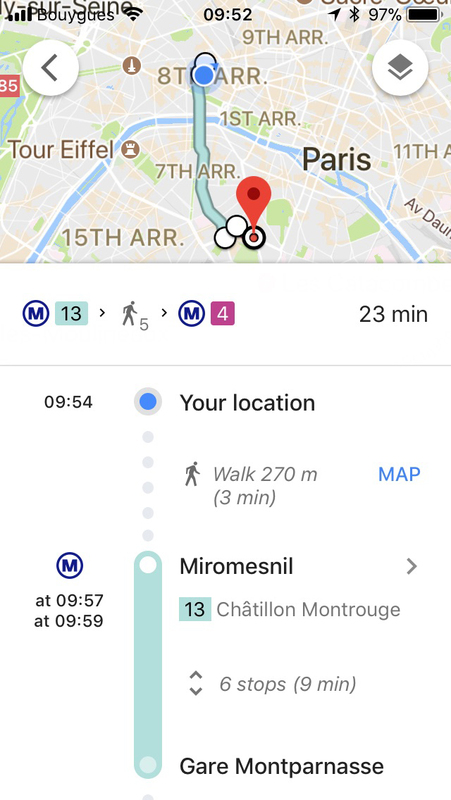 Use Google Maps to tell you how to get to your destination including Metro stops and click through maps. You buy a Carnet at any Metro station, either from the ticket counter or at one of the many machines which couldn’t make it easier. Pay by cash or credit card. A word of advice – normally you don’t need to show your ticket when you leave the train but just sometimes they have checks at the station exit. Keep your ticket until you’re absolutely sure no one is going to ask to see it. A fine awaits you if you’ve binned it prematurely. 4. Make sure your footwear is as comfortable as possible. Of course the cheapest way to get anywhere is on foot. I frequently find myself walking from the Paris Opera Bastille to le Dome Montparnasse. Having tried this once in heels and been unable to walk for days I now walk everywhere, mostly in sneakers or depending on the weather, flat boots. Having comfortable feet gives you the flexibility to travel free of charge city-wide, provided you’re prepared to walk. So you can exercise, sight-see and travel all at the same time. My all time favourite sneakers for walking long distance and looking good are by Geox and I find the most comfortable ankle boots, or any type of boots for that matter, are by Gabor. Both Geox and Gabor have the most comfortable insole padding and rubber outsoles on most of their footwear. Puma are my other 'walk me anywhere' brand for sneakers. 5. Never use the hotel laundry. That can add a huge amount to your trip. Buy a tube of Genie clothes wash gel at Monoprix – the best I’ve ever come across (or the equivalent) and do your own washing. If your hotel doesn’t automatically provide an ironing board, as so many European hotels don’t, ask housekeeping if you can borrow one. Even the swankiest hotels will do this. 6. Never use the hotel mini bar – probably obvious. If you want snacks and drinks again find your local supermarket or, in France, Monoprix or Franprix and buy your own. That midnight attack on your mini bar can cost you the equivalent of a meal. 7. Go out for breakfast – most hotels charge a fortune for breakfast if it’s not included in the price. Either seek out your local cafe or buy fruits and Muesli and eat in. This will of course necessitate your packing a picnic bowl/plate/spoon but either will save you a great deal of money. 8. Always pay in the local currency even when using a card, when given the option don't pay in GBP. If you do you'll be penalised by two currency conversions instead of just one at your bank or card company. Google Maps. Tripit. Google Translate.